Having been stymied in our quest for Haji Noora’s Nihari, Abhik and I were racing past ISBT en route to Chawri Bazaar, when it struck him that we should stop at the Tibetan colony at Majnu ka Tila. Abhik was in quest of Sukuti, or strips of dried buff fried in onion, garlic, and green pepper. At eight o’clock in the morning, the area was barely shaking off its slumber. Hardly any of the roadside stalls was open for business, and out of lack of choice more than anything else, we plonked down at a place run by Chhorten, a spry fellow in his thirties, and an unnamed little boy, cherubic as only Tibetans can be. Sukuti was apparently not available before ten o’clock, but he did have some Momos to offer, if we’d just take a chair and relax. Momos are nothing but the east asian version of steamed dumplings, a dish my Russian roommate in Chicago had often relied on in lean days, much as Indians seemed to fall back on Maggi noodles. The Russians and sundry Eastern Europeans like their dumplings filled with pork and accompanied with soya sauce and sour cream; the east asians prefer a variety of meats, and a hot red sauce. The Indianized version available at most roadside “chinese” vans in Delhi tend to overcook the filling, which is either some vegetable gunk or chicken, and some go as far as frying the momos. The Majnu ka Tila momos, thank goodness, were steamed, filled with mutton (done rare), and accompanied with a steaming bowlful of mutton stock — just what the doctor ordered for my soar throat. And unbeatable value for money — a plate of eight pieces plus stock, all for a tidy 25 bucks. There is, though, another momo joint much closer to my part of town, that I adore. Yes, you don’t get the accompanying soup and yes, you need to fork out a bit more for the location. But the chicken momos available at a hideously pink-and-green “chinese” van right next to the Nirula’s under the Defence Colony flyover, are otherwise fabulous. 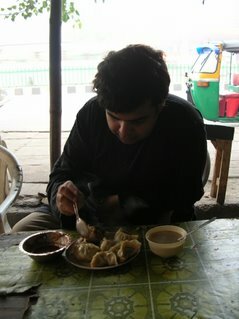 Gourmet’s Delight serves a plate of very generously filled momos, with the thinnest of dough envelopes, for Rs. 40. The accompanying red sauce is grainy and thick, and the spice level lets you enjoy the taste of the momos rather than let it all go down the hatch in a ball of fire. Order one of their soups (my favourite is the chicken sweet corn, which again, is just brimming over with the meat), and it’s a complete meal!